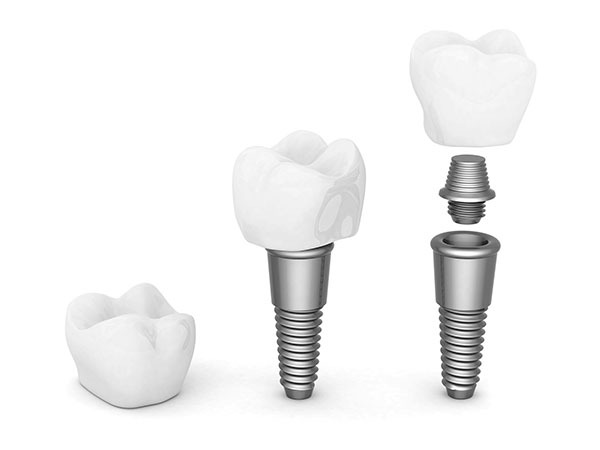 Dental implants are a permanent solution to the loss of a tooth. To ensure that the implant(s) are permanently integrated into your smile, they are placed in the location of the previous “root” of the missing tooth. They will assimilate with the jawbone during the healing process. This should take approximately 3 months. Then the “tooth” or “crown” will be cemented onto the post of the implant. The patient should allow for minimal recovery from the first phase of procedure. There are two phases of the implant placement process that need to be completed before the crown can be permanently cemented on. The first phase is in the office and will require anesthetic before the surgery, the same as with many dental procedures. The doctor will make a small incision in the gum at the pre-determined site of the of the implant. It will be placed and pressure is then applied to the site of the implant to quell any minimal bleeding. Many times there is no need to use sutures. The second phase of implants surgery is a slightly longer less involved, phase of the process. You will need to make sure that the site of the dental implants heals quickly. To help you with this, we will provide post-operative instructions to follow. Rest is a critical component of recovery. We recommend you take twenty-four to forty-eight hours to rest and avoid any strenuous activity like running, or heavy lifting. After the initial day, you can return to life as normal but should understand that your body is still healing and will continue to do so for several days. 3 months is the recommended time to allow for the integration of the implant before the permanent crown is cemented onto the implant. We will prescribe an antibiotic for you to take. This antibiotic course will start the day of the surgery and will last for several days. It is important that you complete the entire course of the antibiotic. Since antibiotics can be upset your stomach, it is recommended that you take your medication with food. We also recommend rinsing the sight with warm salt water a few times a day. This will work to keep the dental implant site clean and help with the healing process. Slight bleeding is perfectly normal after a surgery. In the case of dental implants, you may see some blood in your saliva and may have the taste of blood in your mouth. This usually lasts for around 24 hours, after which the bleeding will stop on its own. Many patients have no bleeding that is noticeable. You should also anticipate slight discomfort which can be alleviated with over the counter pain medications like Motrin, Tylenol, or Advil. If the pain is intense or the bleeding does not stop within 24 hours, you should call us immediately.